This page covers the setting up of my Chillblast Defiant Laptop running under a dual booted system with Windows 8.1 and Linux Mint although I have never used the Windows system! Mint is built on top of Ubuntu and both sit at the top of the popularity stakes but Mint has the advantage of the Cinnamon Desktop. The Defiant 2 and Defiant 3 have upgraded video chips and a slightly faster processor but are otherwise identical. The nVidia drivers are the same for both models so everything written here should be equally applicable to both models. The 'Bottom Line' is that everything that is essential, works 'out of the box' although a couple of tweaks are still desirable and, of course, software needs to be installed to handle the dual graphics configuration and save power by switching the discrete graphics card on and off when not required. The latest kernels in Mint 17, 18 and 19 have greatly increased the support for the advanced Optimus configuration and nVidia GTX 765M, 860M and 960M cards. I have written applets to support the dual graphics configuration and monitor the GPU temperature. I updated progressively to Mint 19 which is a LTS (long term support) version with up to 5 years life from Mint 16, either by updates or reinstallations using the same home folder. The text has been updated but the old version for Mint 16 is here. Mint 19 has considerable differences so there is quite a big upgrade section included covering Mint from 18.3 to 19. Finally I installed a 250 Gbyte Samsung 860 evo SSD drive which has made a considerable speed up in boot times and made the machine feel even more lively - install one from the start! Things to be done on a new Defiant before installing Linux in a dual boot configuration. Grub boot changes - fixing brightness keys, fixing HDMI sound and booting to last kernel used. Installing Bumblebee - this is a way to control use of integrated and discrete Graphics Processor Units - not essential with latest nVidia drivers as nVidia Prime can be used. Optimising Bumblebee - use of Primus and command line options, little known options which can improve performance - again not required if nVidia Prime used. Bluetooth - Bluetooth Audio is fine but issue with use with modem in a conventional mobile phone for internet access - not Defiant specific. Changing the file system table (/etc/fstab) to auto-mount the new partitions in the right places. Wine - Fixes required on updating to the latest version. We spend quite a bit of time away from home and we have two MSI Wind Netbooks which have enabled us to keep up to date with most activities and provide music through the WiFi and bluetooth connection on our narrowboat and even watch some TV through a dongle. They are many years old and have been running out of power. But what finally precipitated Pete into looking for a replacement was the old video camera gave up and the replacement was, of course, HD and the ageing desktop could barely handle the load of video processing, leave alone the netbooks. During investigating a replacement it became clear that the nearest specification to meet our requirements tended to designated ''gaming' computers with both fast processing and good graphics. In looking through possible machines we came across the Chillblast range - they have a very good reputation for their desktops but have also started to produce some 'gaming' laptops including a small one called the Defiant which looked powerful enough to even handle video editing. We always keep up with pictures on route but this would give the opportunity to keep up with videos to avoid increasing the huge backlog. The Defiant has a Haswell architecture with an Intel Core i7 Quad processor (effectively 8 through hyperthreading) and two graphics processors, the integrated Intel 4600 GPU and an extra nVidia 765M Graphics Processor Unit (GPU) combined with the Optimus technology which only powers up and uses the power consuming discrete GPU on demand thus providing a reasonable battery life. Preliminary checks show it renders video about 5 times faster than the current 64 bit AMD Athlon 5000+ desktop and 25 times faster than the MSI Wind U100. It renders H.264 720i video at about 80% of real-time and 1080i even full HD (1080i) editing should be perfectly practical on the move. We wanted obviously wanted a machine which was light for traveling but powerful and versatile enough to replace the Desktop and was largely self contained. The Defiant has a 13.3" 1920x1080 screen and weighs 2 kgs plus the weight of a 120 watt power adapter. It has a 1000 GByte hybrid drive (8 bytes SSD smart buffer) and 8Ggbytes 1600 Mhz RAM. It has no DVD but has Wifi, Bluetooth and an SD card reader and an HDMI output as well as VGA. We expect to largely run Linux but would prefer to also have a dual boot to Windows because of Pauline's teaching where we have to be sure that everything will work 100% although we can not remember when Pauline or Peter last used Windows other than helping others to remove the inevitable viruses. The following notes on the installation of Ubuntu are based on our Road to Freedom - A progressive migration from Windows to Ubuntu for Safety, Security and Savings in Home Computing and this will eventually provide a third part to that series - perhaps we will call it The High Ground. The Chillblast Defiant was designed for gaming so has exactly the sort of specification which is required for Full HD Video editing. It has a vastly powerful Core i7 4700MQ 2.4 Ghz (3.4 on Turbo) quad-core (8 thread) processor, 8GB of 1600MHz DDR3 memory and mine has a NVIDIA’s GeForce GTX 765M. It has Optimus technology so when I am using the machine for something less demanding than Video processing, the GeForce switches off and the Intel HD4600 takes over, saving considerable power. It has a 13.3” screen with a Full-HD 1920 x 1080 non-reflective display. A 1000GB hybrid SSD / HDD gives rapid fast response rates and plenty of space for Video editing in a single device, 2 mSATA SSD slots are available to provide even faster dedicated storage for the OS if desired. 8GB of RAM comes as standard, expandable to 16GB. I added an 250 Gbyte Samsung 860 Evo SSD at a latter stage. The Defiant measures 330mm x 227mm x 329mm and weighs 2.1 kg including the battery and is claimed to have up to 5 hours battery life which i never acheved. The MSI Wind has 5.5 hours on its power bulge 9 cell battery and weighs 1.4 kgs for a 10 inch 1024 x 600 screen. It should be a huge improvement. Heatpipe removed to show CPU and GPU. Two mSATA SSDs are also fitted in this picture. nVidia Optimus is an computer graphics hardware power/performance optimisation technology created by nVidia which, depending on the resource load generated by client software applications, will transparently and seamlessly switch between two graphics adapters within a computer system in order to provide either maximum performance or minimum power draw from the system's graphics rendering hardware. With Optimus you can choose when to use the more powerful and battery consuming nVidia graphics card or to use the integrated power saving Intel or ATI graphics. This allows you to improve your battery life while also giving you access to more powerful graphics when needed. Up untill recently the best way for Optimus enabled laptops to work in a Linux systems was a project called Bumblebee which enabled the nVidia Optimus Graphics processor. The latest versions of Bumblebee provided automatic power management so the nVidia Graphics card is turned off when the machine is started to save power and heat generation and is only turned on for programs which required it. A program which requires the graphics processor is specifically started in that mode by the user through Bumblebee and the Graphics card is automatically turned off when it is exited. Recently nVidia have made available their own software which works alongside their proprietory drivers to enable one to switch between the Inbuilt Intel Graphics and the more powerful but power consuming Nvidia Graphics. The sytem is called nVidia Prime. It works slightly differently in as much that it one or other graphics processor is enabled all the time and can only be switched by loging out and back in. Bumblebee enables selected programs to be called using the nVidia whilst everything else continues to use the lower power built in Intel Graphics. Bumblebee is included in the very latest Ubuntu/Mint Distributions so most users may not need to install it through a PPA, likewise there are up to date nVidia drivers although the latest can be accessed through a PPA. Despite what people say it works on both 32 bit and 64 bit Linux kernels and the 32 bit systems seem to be more robust and supported. Initialy it did not seem to work well with the latest nVidia drivers but they have good built in support via nVidia Prime and that is automatically set up in the latest versions of Mint so I switched to nVidia Prime when I updated to Mint 17.3 Rosa. Since then I have switched back again to Bumblebee and it seems to work with both 17.3 and 18.1 although some tuning needs to be done depending on the drivers and Cinnamon one is using. Chillblast are being very helpful and I found out at an early stage know that the Defiant is based on the Clevo WS230ST chassis and I was able to download a 'generic' manual from the Clevo web site which answered some of my questions on the BIOS whilst I was awaiting delivery. More importantly it enabled me to widen my search to other machines using the same chassis and I have come on a very useful thread namely the Sager NP7330 Linux Guide/Review which indicates that some people are successfully running a machine based on the same chassis under Linux. There is also a lot of information in these threads http://forum.notebookreview.com/sager-clevo-reviews-owners-lounges/715556-official-clevo-w230st-sager-np7330-owners-lounge.html and a very full review here http://forum.notebookreview.com/sager-clevo-reviews-owners-lounges/725922-htwingnuts-sager-np7330-clevo-w230st-review.html . There are other firms using the chassis (in the USA) but nothing like the coverage as the Sagar. Things I initially did before installing Linux with dual boot. Set up Windows 8.1 - most of time was taken finding out how to shutdown it down!! Explore Partitioning and Partition Drive under Windows to give large unallocated space at early stage before Windows has spread all over it. Explore Bios (UEFI and Video Driver switching in particular) and record keystrokes to reset BIOS 'blind' - may be some information in manuals. Check it will Boot from LiveUSB and/or external USB DVD drives. Probably need to turn off Secure Boot and Fast Boot options in BIOS if enabled. (2:05) to 32 bit LiveUSB of Mint 15 Olivia working. Note Mint 16 Petra took a lot longer initially as a simple workaround is required to boot the LiveUSB - the same is true of Mint 17 Qiana. Make sure Windows own Virus checker and firewall are active. Is Microsoft Security Essentials good enough - Comparative results of Anti Virus programs - barely! Format Partitions using gparted on LiveUSB (2:57) and check Windows still OK and boot (3:01). New requirement since my initial installs You must turn off the Windows 8.1 Fast Startup (hybrid boot) option as it will lock one or more of the drives used by Windows making them inaccessible to Linux. This option has now become the default. Click on the Choose what the power buttons do link on the left side. Under Shutdown settings, clear the "Turn on fast startup box" and click the Save changes button. It is also much safer to disable Hibernation as this can cause big problems if you change operating systems whilst hibernated! The first time it only took me 3 hours to get a protected Windows 8 system with a large chunk of free disk space to install Linux and run a LiveUSB. Setup: To enter Setup, turn on the computer and press F2 (give the system a few seconds to enter Setup; the F2 on screen will be highlighted to illustrate that the system is processing the request) during the POST (or press F7 for boot options). If you get a “Keyboard Error”, (usually because you pressed F2 too quickly) just press F2 again. Boot Menu: To see the boot options press F7 there seem to be two wide windows of time so this is easy with a LiveUSB but DVD drives may not be ready and require a pass in an out of the Bios Setup to buy time. I downloaded the iso of Ubuntu 13.10 Saucy Salamander 64 Bit (AMD) version and used UNetBootIn under Linux to create a LiveUSB with Persistence as well as burning a standard LiveDVD . UNetBootIn runs under Windows and Linux to create the Live disks. Neither this or the equivalent Mint Olivia would boot on the Defiant either from LiveUSB or DVD using F7. The DVD needed time to spin up and be recognised so I found entering and then leaving the BIOS setup (F2) gave time for it to show up on the next F7 in the Boot menu as the machine was not powered down that way. To cut a long story short both Mint 15 Olivia and Ubuntu 13.04 were happy to boot in x64 and i32 forms after the changes below. I did a lot with Mint Olivia x64 in Persistent LiveUSB form including installing updated nVidia Drivers from the PPA (version 319.49) and then Bumblebee (version 3.21) from the it's PPA and got some very impressive results with glxspheres which ran about three times faster on the nVidia 765m than on the internal Intel 4400 which was still much faster than anything I have. The current version numbers will be different. This should be a two part process with the initial shrink of a partition under Windows and final partitioning using Gparted under Linux. Somewhat to my surprise it was using the older MBR partitioning which implied that it was not UEFI booting machine which I had expected from a machine running Windows 8.1. Ubuntu/Mint will handle UEFI but it would have put a requirement of a 64 bit install. It was avery basic arrangement with a large partition for Windows (C: drive) and a small reserved partition which probably contains recovery software but not a full install image which many computer manufacturers do for easy of support and the economy of not having to provide DVDs nor the special partition for the UEFI boot. It did make it very easy as I knew reasonably well what I was doing and had done it all with the same software lots of times. All that was left was the exact planning. and layout. So what I had was just the first tiny 350 Mbyte partition which should not be touched and a huge NTSF partition (C:) with Windows system covering the rest of the disk. So how far to shrink i? Windows 8.1 has to have a minimum of 20 Gbytes but I had lots of space so I chose 120 Gbytes so it could still be really useful or could be shrunk again. I needed several partitions and the maximum number of primary partitions under the old MBR scheme is 4 so I used one for a swap space and put all the rest into a logical partition. Swap is conventionally at the top (unless there is already a Windows recovery image partition) and 2 x the real memory and but that gave 16 Gbytes but so what as there is a lot of space. 8Gbytes would be plenty and the chances of using even that much with linux is very small even with video work. This was initially planned to be a 64 bit system so I roughly doubled what I would normally consider for the root partition (/ 40 Gbytes) and reserved space for another root partition (30 Gbytes) so I could triple boot during development. I also left part of it unallocated at this time (for a spare home partition or encrypted partition for security??). Then I added a home folder to share between my systems of 200 Gbytes (/home) and the rest 500 Gbytes as an NTFS partition for data (/media/DATA) which can also be accessed from Windoz. The screen dump above is from my actual set up After Mint has been installed so the mount points show. The partition labeled reserved is to allow an extra system to be installed and allow triple booting of a development system in the future and there is also an unallocated area for an extra home partition or system (or anything else I have not thought of yet. I am now leapfrogging forwards using these two partitions in turn and as I update this I have Mint 16 and Mint 17 RC installed. Since setting up the Defiant with Mint 15 a new feature has been included which is called TimeShift which makes a considerable difference to the size of root partition required. TimeShift is fundamental to the new update manager philosohy. To Quote "The star of the shown Linux Mint 19, t is Timeshift. Thanks to Timeshift you can go back in time and restore your computer to the last functional system snapshot. If anything breaks, you can go back to the previous snapshot and it's as if the problem never happened. This greatly simplifies the maintenance of your computer, since you no longer need to worry about potential regressions. In the eventuality of a critical regression, you can restore a snapshot (thus canceling the effects of the regression) and you still have the ability to apply updates selectively (as you did in previous releases)." The best information I hve found about TimeShift and how to use itl is by the author. TimeShift is similar to applications like rsnapshot, BackInTime and TimeVault but with different goals. It is designed to protect only system files and settings. User files such as documents, pictures and music are excluded. This ensures that your files remains unchanged when you restore your system to an earlier date. Snapshots are taken using rsync and hard-links. Common files are shared between snapshots which saves disk space. Each snapshot is a full system backup that can be browsed with a file manager. TimeShift is efficient in use of storage but it still has to store the original and all the additions/updates over time. The first snapshot seems to occupy slightly more disk space than the root filesystem and six months of additions added another approximately 35% in my case. I run with a root partition / and separate partitions for /home and DATA. Using Timeshift means that one needs to allocate at least an extra 2 fold storage over what one expects the root file sytem to grow to. In the case of the Defiant under 18.3 the root partition has grown to about 11 Gbytes and 5 months of Timeshift added another 4 Gbyes so the partition with the /timeshift folder neeeds to have at least 22 Gbytes spare if one intends to keep a reasonable span of sheduled snapshots over a long time period. After three weeks of testing Mint 19 my TimeShift folder has reached 21 Gbytes for a 8.9 Gbyte system! This space requirements for TimeShift obviously have a big impact on the partition sizes when one sets up a system. My Defiant was set up to allow several systems to be emplyed with multiple booting. I initially had the timeshift folder on the /home partition which had plenty of space but that does not work with a multiboot system sharing the /home folder. Fortunately two of my partitions for Linux systems are plenty big enough for use of TimeShift ( 40 and 45 Gbytes ) and the third which is 30 Gbytes is accceptable if one is prepared to prune the snapshotss occassionally. There are also some quirks with several SSDs when using Linux, one of which is a show stopper as the Samsung 850 Evo is favoured by Chilblast. There is a work-around in later kernels which has been backported to the Kernels which Ubuntu updates to but not the kernel recommended by Mint. See https://bugs.launchpad.net/ubuntu/+source/fstrim/+bug/1449005 and https://bugs.launchpad.net/ubuntu/+source/linux/+bug/1338706. The kernel in use must newer than 3.13.0-57.95, 3.16.0-43.58 or 3.19.0-22.22. Kernels older than 3.12 and latter than 4.0.5 are all fixed. In summary you will lose data with the recommended configurations of Mint 17.0, 17.1 and 17.2 if you have a current Samsung 8xx series SSD (or older models if you update the firmware) and you have TRIM enabled which is also the default for Mint and Ubuntu. The problem occurs because the latest SATA specification includes a version of TRIM which queues requests. This has been implemented in kernel 3.12 but the Samsung SSDs have an error such that they report it is available whilst it actually does not work and destroys data. Older drives have updated firmware which then produces the fault as well. The fix in the kernel blacklists all calls to queued TRIM for all Samsung 8xx (including Evo and Pro) SSDs. The kernel in Mint 17.3 is likely to be OK so I am not adding fixes yet - web searches will show how to disable TRIM in Ubuntu, in the short term the slow down will be acceptable. After finishing the installation, it is possible to find that you have Windows 8 disabled from booting and it only boots to Mint (or Ubuntu), do not worry. In this case you can install a small utility to sort this out. Boot Repair may report mention a GRUB error. In most cases, just click on Apply and boot repair fixes everything. Now reboot and you should see again see a Windows 8 and Ubuntu/Mint options. I should add I have installed boot-repair as a precaution but have not yet used it in anger! This is a step most users will not bother with. I did a number of installs of different systems before the final install. You must use custom partitioning and make sure you are installing into the correct partition for root and setting that partition to be reformatted every time you load a new system. This enabled me to try out 32 and 64 bit systems and see what problems came about. It turned out that the 32 bit systems booted easily and the 64 bit systems of the Ubuntu and Mint versions I wanted to use gave problems in booting after installation. It is likely that was caused by the same problem that prevented the Mint 16 Petra LiveUSB from booting which was the open source nouveau drivers which are known not to play well with optimus until the proprietary drivers are installed and were preventing access to the internal graphics. A catch 22 as one needs to get a system installed and then load bumblebee which blacklists the nouveau drivers from loading during booting. what was important was the comparisons between 32 and 64 bit which led me to favour a 32 bit install at the time. So once I had confirmed which system to install the actual process was simple. The LiveUSB is run again and the various questions answered up to the partitioning where custom is selected and the partitioning above set up partition by partition including a home partition ( /home) . The only partition which is formatted is the one set to root ( / ) I used ext3 for the trial installs but for the final install of Mint 16 Petra and Mint 17 Qiana I used the newer and slightly better ext4. NOTE: When you do the final install you want to make sure that the use your primary username as the one used during the install - this is important for a number of reasons. This makes subsequent upgrades easier and also cloning the machine. This initial user is special in several ways. To find out more read the sections below and the sections on distribution updates and on mounting files systems for use with Unison and other programes that require timestamps to be updated. Addition steps if you are already a Linux user and want to transfer an existing user. This only works well if the user you want to transfer was the first user set up on the other machine and the same user name and password is used on the new machine as it creates a folder in /home for that user an done can then bring in an existing home folder from another machine. I have written about the procedures for doing that under Carrying out a Distribution Update and Backing Up using tar archives. GRUB_CMDLINE_LINUX_DEFAULT="acpi_backlight=vendor i915.disable_power_well=0 nouveau.modeset=0 quiet splash"
GRUB_DEFAULT=0 will boot the first menu item and so on. GRUB_DEFAULT="saved" will boot the same entry as last time which I prefer. GRUB_TIMEOUT=3 will display the grub menu for 3 seconds rather than the default of 10 - life is too short to waste 7 seconds every boot! acpi_backlight=vendor is an addition to make the brightness keys work correctly. i915.disable_power_well=0 is needed in Mint 16 and Mint 17 if one wishes to use the HDMI audio - otherwise it, and associated videos, run 20% fast. nouveau.modeset=0 - This is an Essential addition to allow booting when using Mint 16 Petra or Ubuntu 13.10+ by inhibiting the nouveau driver. It may not be needed with Mint 17. You will notice that there are two Windows entries shown - always use the first. 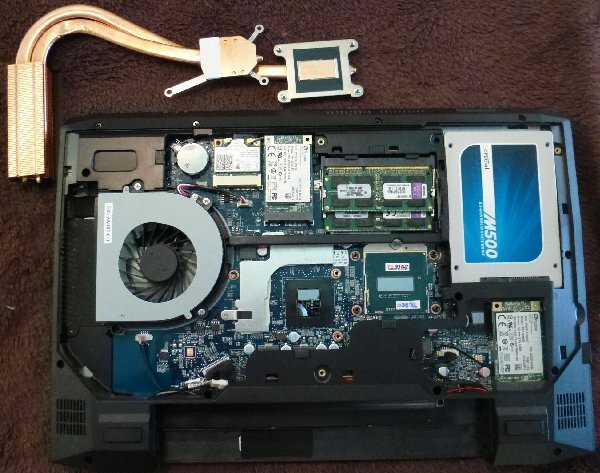 Many recent computers, in particular, laptops and netbooks as many computer manufacturers no longer supply the Microsoft CD/DVD for Windows but instead have a hidden partition which has a disk image to restore the machine to exactly the state you bought it. Unfortunately this is not hidden to Ubuntu and it is given as an alternative operating system in the Grub start up menu. It is not always obvious which is which without knowing the partitioning so it is possible for the unwary to boot into the Restore Disk which is not good news as you are only a key stroke away from deleting everything and reformating the hard drive. I will not cover how to remove that from the menu here as it covered in Fun with Ubuntu - Customising The Grub 2 Boot Loader Menu but I should note it counts as a more advanced activity. Bumblebee provides support for NVIDIA Optimus laptops. Using Bumblebee, you can use your NVIDIA card for rendering graphics which will be displayed using the Intel card. Bumblebee is officially supported by Ubuntu in 13.10 Saucy or newer. For Mint 17.3 and 18.1 you will already have the nvidia-375 drivers installed but you may have to chose them in Driver Manager. Currently the bumblebee in the repositories does not work well with nvidia-375 and you have to use the bumblebee testing PPA. I am not sure about higher versions of nvidia. That and much of what follows came from an excellent WebUp8 article which I encourage you to read. You may find it already present, I found it twice and had to remove one to make it work! NOTE: These changes need to be repeated every time the driver is updated so that is the first thing to check if bumblebee stops working. And in this file, make sure that the "BusID" line is not commented out (it shouldn't have a "#" sign in front of the line), and that it matches your Nvidia graphics bus ID. If it's not, change it, then save the file. Normally you do not use optirun for your window manager, installations or other non graphic heavy demanding programs. The optirun command is mainly used for graphic demanding programs or for games. In the long term one will edit/create new .desktop files for programs using the NVidia driver. There is an alternative to optirun - primus which is less developed but may offer advantages to optirun. This runs the nVidia settings program. The use of optirun is required to turn on the card before running nVidia Settings - the other options flags are only needed with nVidia settings. nvidia-settings should not work fully without optirun if the card is disabled which is the case. Uninstall the Nvidia-Prime applet to be safe. Webup8 also emphasises that if you later want to remove Bumblebee, make sure to purge it ("sudo apt purge bumblebee"), to make sure its configuration files are removed, or else you'll experience issues, like the Nvidia drivers remaining blacklisted. I also checked power consumption and GPU temperature as an indicator. Bumblebee uses VirtualGL to copy the image generated by the second (faster) GPU to your display. VirtualGL was intended for use over a network though, so it takes a great many steps to enable this (compression, sending the image over a network link, decompression, etc). Primus doesn't perform all these "extra" steps, instead taking a more direct route (copying the rendered image in memory to the other GPU, then displaying there). In theory this should get you better performance as well as better compatibility. Running applications will "see" the OpenGL implementation of your real hardware, nothing virtual is presented to them. I have not been able to reproduce the speed improvements that Andrew got even when using "vblank_mode=0 primusrun" instead of simply running "primusrun". It is working but primusrun is not quite as good as optirun even in that mode. - VirtualGL performance is very dependent on the Transport method set. The default "proxy" setting appears to perform bad in some situations. Try other available settings like "rgb" or "yuv". - in many cases, primus offers better performance; please try it and report compatibility issues in primus tracker, if you find any; for now VirtualGL is still preferred as the default auto detected render bridge, while primus is being tested at larger scales before being released as default. The compression method can offer significant improvements in speed. The Integrated Intel 4600 Graphics gave 130 Mpixels/sec. Using primus gave 239 Mpixels/sec with video blanking switched off. Using the optirun default gave 270 Mpixels/sec. Using optirun with yuv compression gave 315 Mpixels/sec and jpeg compression gave 361 Mpixels/sec (33% better than the default). The most interesting result perhaps was that turning video blanking off for the integrated graphics processor gave the best result of all at 385 Mpixels/sec. All were with the window maximised on a 1920x1080 screen and nvidia-319 driver. I have not carried out respective power measurements. Update: I have rerun the tests with the latest nvidia driver nvidia-375 and the results are similar but my impression is that the performance is slightly lower and certainly no better. In summary - it is worth trying the various options on real programs as the glxspheres test does not exercise the graphics processor fully and there will be tradeoffs in quality of speed, power and display. However for normal use the integrated graphics seem very good and the lower figures for it are often because of the video blanking limiting the performance to that of the screen leaving a large margin in hand. Update: I have found a lot of similar conflicting performance results with primus in the comments on the Webupd8 page Primus: Better Performance And Less Power Consumption For Bumblebee but nothing much on compression mechanisms. This is an applet I have write to get round the problems of the existing nVidia/Bumblebee Monitoring Applets, in particular that of additional power usage when the nVidia Card is not in use. The screenshot shows two sample programs set up in the left click menu and the DGPU is on so the temperature is displayed. You will note that there are two additional and useful applets to the right of BAND. It either displays the nVidia GPU temperature when running or a message that the DGPU (Discrete Graphics Processor Unit) is off. It interrogates bbswitch to get the status and when the card is on it uses nvidia-settings to get the GPU temperature. It uses the same fudge as gputemperature@silentage.com to run nvidia-settings synchronously and writes the output to a temporary file in applet folder. It currently has a delay of 20 seconds on loading before it gives information as bumblebee and bbswitch seem to take a while to come up at boot time. The right click context menu gives the ability to easily run the nVidia Settings program without use of the terminal and also the System Monitor and Power Statistics, all useful for monitoring Bumblebee and power consumption which is paramount when using a laptop on batteries. The standard left click menu provides a configurable list of programs which one can run using the discrete nVidia graphics through Bumblebee - this otherwise requires them to be called through optirun in a terminal or via a modified launcher. This list is configured using the standard applet configuration mechanism available from Cinnamon 1.8 . One can also configure the update rate of the applet in settings. The latest version can be downloaded from the Cinnamon Spices Web Site. There is a longer write up on my Cinnamon Spices page. Possible but not explored yet - I understand that an nVidia Settings configuration file needs changing to make this feature visible. Set up file system to correctly mount a ntfs 'DATA' drive to allow use of unison and other programs which needing to set time stamps. The mount point for the DATA partition (/media/DATA) should have been set up during the partitioning but I still find it necessary then edit the file system table /etc/fstab to get it auto-mounting as I want. The problem is that only the owner can reset time stamps on files which is required by some synchronisation programs such as Unison. This also makes the choice of initial user important. Again this has been written about in the past at the end of the first reference above and is not of the essence for this write up but for information my section of fstab now looks like. The changes firstly set the owner (uid is User id) to the main user who will be the only one who will be able to set timestamps. The second change means that the mask which sets the file permissions allows everyone read write and execute access rather than just the owner and group (46 is plugdev group) - you may want to keep that tighter. Ubuntu (and therefore Mint) have changed the mount points for USB drives from /media/USB_DRIVE_NAME to /media/USERNAME/USB_DRIVE_NAME. One can change the behaviour by using a udev feature in Ubuntu 13.04 and higher based distributions (needs udisks version 2.0.91 or higher). lm-sensors is used by some of the monitoring applets. It needs to be set up initially by running a setup in the terminal. You have options to let it investigate many options and there are preferred yes/no options for each - you should keep on to the safe side and not scan those that are not recommended and certainly NOT the graphics chip ones at the end, not only because nvidia-settings provides the information but also they have been reported to occasionally cause problems and the cause is unknown. It is however believed to be safe for monitoring CPU temperatures. There us an applet which uses lm-sensors and displays the CPU temperatures for each core plus an average in panel called CPU Temperature Indicator 1.0 which I have loaded at present. You can see it in the panel in the screendumps. The screendump shows applets for Network, CPU temperature, CPU loads (running flat out processing video rendering), Memory Usage breakdown including caching and GPU temperature (GPU on at time). The full information is on the popup. It also shows system applets for bluetooth and brightness to the right. That worked for him on Half-Life2, Portal and The Talos Principle. A green screen can occur in Kdenlive, Openshot and VLC with their standard configurations but not in the Mint Videos player or Cheese (the webcam application) . Videos: This is the pre-installed player in Mint 15 and is actually the Totem player. This does not have the Green Screen problem as far as I can tell. VLC: Version 2.08 offers Video driver option and leaving the Accelerated box ticked and the output set to OpenGL GLX video output (XCB) works well. I have not explored all the options. Kdenlive: This seems to be a driver problem and Settings -> Configure kdenlive -> Playback lists 10 options of Video driver to use as well as an OpenGL tick box. Choosing XVideo and ticking the OpenGL box works fine and gives a smooth preview even without optirun. I have not explored all the other options. >>> reboot if you used previous command (fonts)! Worked for me but there are some other hints in final post of Oct 29th in link above. This is a known problem and has to do with a library package which exists in several locations including within googleearth. The one in googleearth is incompatible on some systems leading to this error. There are two solutions to try. I initially only tested without Optirun and using Displays under Settings. Setting the LCD to the same resolution as my Goldstar 23" DVI enabled monitor (1680 x 1050) through a converter cable enabled mirror use and I could also choose either by switching the other monitor off in the panel. Using a dual monitor set up may be possible but I have not tried it. I have since tried with an HDMI input on a 1920x1080 TV and again it worked fine with both in the same resolution and one could switch from one to the other or mirrored. If mirrored was set one could unplug and replug the monitor and it would sort itself out automatically. The same applied for a VGA cable and leaving a mirrored setting seemed to be good. The settings were preserved through a suspend. The use as a monitor seems fine. No sound and no sound settings to switch to HDMI sound when using Mint 15. This is solved in kernel 3.11.0 used in Mint 16 Petra and I have done some tests on Qiana now it is available and sound was available fine but see the next problem! Interrupt the boot process during the countdown period by moving up and down and enter the edit mode by the Tab key (or as described on the screen if you are not using Mint). An editor will open up that will allow you to temporarily change the grub options for the next boot, in Mint this allows access to a single line where additional options can be added or the existing options modified. Add i915.disable_power_well=0 before the --persistent at the end of the line. The changes made to the grub entry only work for the current session. To permanently make changes you need to edit (as root) the /etc/default/grub file and add i915.disable_power_well=0 to the GRUB_CMDLINE_LINUX line and then run sudo update-grub. This does not however work on a LiveUSB as you are not able to update grub so you have to edit the line every time. Changes to GRUB on installed systems are covered in more detail at Grub boot improvements where a number of additional changes which are best all made at the same time are covered and I have included this change until it is fixed in the kernel. I have done upgrades from Mint 17 to 17.1 and then 17.2 and these additions seem to remain in the grub file. This uses the Intel Centrino Advanced-N 6235 802.11a/g/n, dual stream 2x2, dual-band WiFi + Bluetooth 4.0 PCIe half mini card. See http://www.intel.com/content/dam/www/public/us/en/documents/product-briefs/centrino-advanced-n-wimax-6235-brief.pdf for more details. I understand from Chillblast that the WiFi works much better with WPA than WEP which I still have on a router for old XP machines and hardware. It seems fine close round the house with WEP but this is probably the excuse to change. The card has both hardware and software switching of radio but the hardware mode does not seem to be implemented in Mint so there may be a small extra power consumption. Bluetooth was one of the last issues to address on the Defiant and I have some slightly mixed results on what I have tried. The bluetooth Applet is new in Cinnamon 16 in that it is now in the Cinnamon Settings but closely based on what went before with gnome-control-center. It works fine for pairing a bluetooth audio receiver which enable me to pass audio to the HiFi on the boat or house without wires. The Audio receiver then works fine as expected. Also tested in Mint 17 and 18. 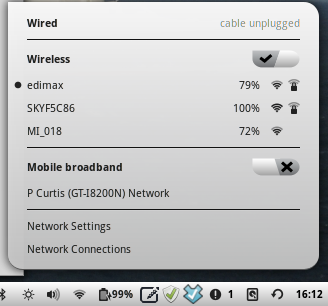 My main use of Bluetooth to access modems in my older phones and use the spare data allowances for internet access in the UK. I have covered this at length in Adding Spices to Ubuntu - Bluetooth and Connecting to the Internet via Bluetooth modems in phones Unfortunately this does not work seem to work under Mint 16 or 17 on the Defiant. Eventually I went back to the Mint 15 Olivia and it works fine on the Defiant both using the inbuilt mechanisms through the network manager and also through gnome-ppp which is my usual way because there has been a problem starting at kernel 3.8 with the inbuilt mechanism. Neither way works under 16/17 and this seems to be a real bug but one not reported and I have filed a bug report at https://github.com/linuxmint/cinnamon-bluetooth/issues/5. I suspect few people 'tether' using bluetooth these days although I know at least one sailor who hauls his bluetooth connected phone up the mast to get a good data connection at sea! The Defiant has an indicator light for Airplane mode and it can be switched on by Fn F11 under Windows and this turns off all transmitters (Bluetooth and Wifi). It is implemented by a Windows Driver. This does not seem to be a hardware switch but only in software and the light seems just to be an indicator which is unrelated to the hardware. If one sets Airplane Mode using Fn F11 in Windows and turns the machine off the indicator is still on when you reboot into Linux (Mint 15) but the Wifi can be turned on and off as usual and works with the light still lit. This is not ideal as there is a real risk that a linux user might not realise and there is a finite, if small, risk that aircraft or hospital systems could be affected. The light does not have any obvious control other than in a dual boot system via windows. 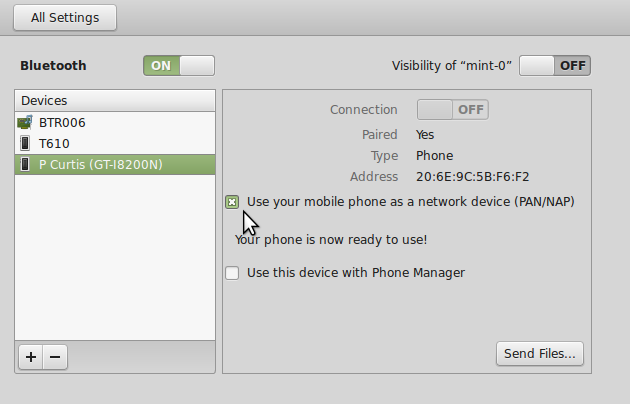 In Mint 15, 16 and 17 the Network Manager -> Settings has a Airplane Mode switch which switches both Wireless and Bluetooth off. I have set up a keyboard map from Super + F11 to open the Network screen with the switch for airplane mode in front of one - it may be possible to look at the code and write a direct call script. Works fine under all Mint versions tested. The function keys (F1 - F12 etc.) act as hot keys when pressed while the Fn key is held down. Fn + F7 Display Toggle - not actually a toggle but provides access to display configuration under Windows. The core of the issue is that there are two interfaces present that are trying to control brightness. If one boots with a kernel boot parameter of "acpi_backlight=vendor" this disables acpi_video0 interface leaving intel_backlight. The acpi_backlight=vendor can be added by editing the boot sequence during a boot to test and if works it can be included by editing the grub start up scripts in a permanent way - this has already been included in the modifications to Grub discussed above. Ubuntu have always recommended running the 32 bit system, certainly for systems of 2 Gbytes memory or under as the additional memory requirements cancel out any gains from the richer instruction set and faster processing. I have done a quick and dirty check on my AMD Athlon 64 dual processor 5000+ with 2 Gbytes of Memory which is on the boundary. Speed in rendering videos (which is a good processor benchmark) was only 5% faster, almost within the measurement noise. Memory use was up 40% on average with quite a wide variation (28% Firefox with many tabs on startup and 54% Thunderbird with many accounts on startup). This is in line with Tests by Phoronix on Ubuntu 13.10 amd64 and i32 where Video and Audio processing showed ~15% gain and only FFTs showed a lot more, in most cases it was a very marginal or none existent gain. I also used the benchmarks at the end of the System Information program - install hardinfo to access it. These tests were run it on a LiveUSB but with a 64 bit system (30% brightness and nothing at all running except the Power statistics screen). 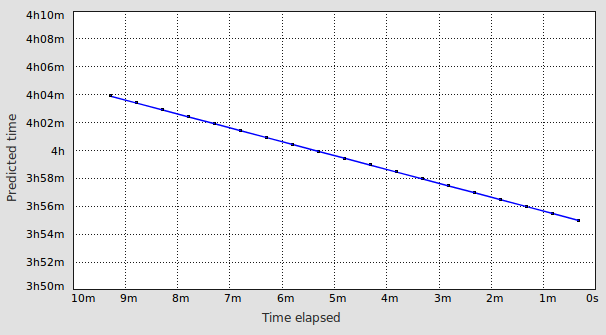 The results are that an idle of 23 watts drops to 16 watts - a saving of 7 watts giving a battery life of nearly 4 hours rather than the 2 hours 40m which is worth having. I get the impression that the 32 bit kernels use less power with the GPU on and slightly less with it off but a like for like would need it to be run under a LiveUSB. The predicted time of operation with the GPU off and no programs running other than the terminal and this monitor - compare to 2 hours 45 mins which is the case with the GPU on and Optimus enabled. There are at least two applications which claim to optimise the power saving settings on linux machines. The are Laptop Mode Tools and TLP. Neither are in the standard repositories and need PPAs to install them. I have tried both and can not truthfully say that either produce any significant savings on the Defiant. 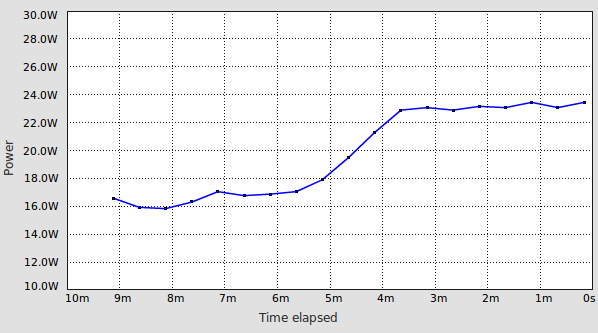 The main power savings options already seem to be well set up and I am pretty sure I would have seen even a 0.5 watt saving and neither produce that in normal use both leave the power at 15.5 watts on idle with firefox open (equivalent to 4 hours on battery) as above. I have left TLP installed. The links are to Webupd8 articles if you do want to follow up further. The main power savings are gained by turning the brightness to circa 30% and turning off the keyboard illumination. I got no significant savings from turning Bluetooth off. Note: I have not found a way to turn Bluetooth or Wifi Hardware off, only to disable in software so there still be some scope for savings. The above screen dump is from the output od the i7z program which is now in the Ubuntu Repositories. This was obtained with a processor load of about 25% average and all 4 processors are in Turbo mode It shows that the core temperatures are at about 65 degrees but the fan was running at quite a high level. The above is using all 8 cores to render h264 HD Video. 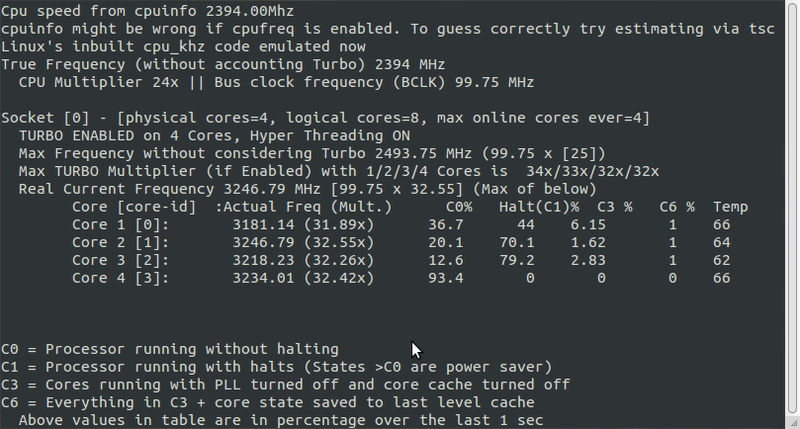 All processors are running close to flat out and the frequency has been dropped back to 3.1Ghz - 100Mhz less than the maximum the Turbo Multiplier for 4 processors provides although the temperature has risen to 87 deg. 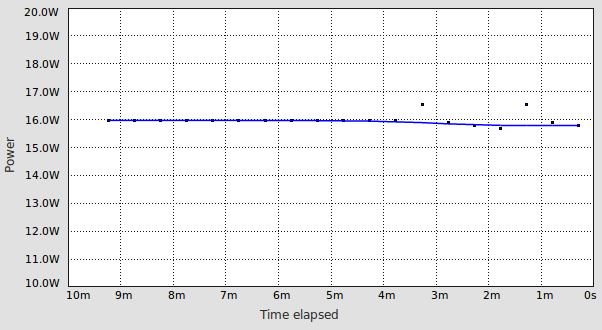 The above shows the situation when the machine is idling - the processors speeds have been reduced lowering power consumption and the temperatures are now low and the fan is not running. In conclusion the Turbo modes and control over power and speed seems to all be implemented under Linux. I have recently added a Samsung 860 evo 250 Gbyte SSD drive to my Defiant and it has considerably speeded up boot times and program loading and overall given a much faster feel to the machine. I have never been convinced that the hybrid drives have been showed much of their promises and this has just confirmed it. Fitting was very easy, 4 screws to remove the base and two empty slots are exposed with only one screw to remove and then replace to hold it down - a few minutes work. I did not change the boot drive or old fashioned booting on the existing drive as it still has the preinstalled Windows 8.1 although I have never run any program on it other than a virus checker when I received the machine 5 years ago so it is really a waste of space. First I reviewed the requirements impossed by use of a SSD. The first time I used an SSD I did a lot some background reading which revealed that there were more nuances in getting a good setup than I had realised. The information I gather ended up quite long and covered a lot of areas which do not need action taken on as they are set up on most amchines by the manufacturers t or are defaults in Mint and Ubuntu. The in depth coverage has moved to a dedicated page on The Use of Solid State Drives in Linux and only the links in Bold below need consderation here on the Defiant and most were already done when I originally set up with a hard disk. The SATA controller mode needs to be set to AHCI in the BIOS. AHCI provides a standard method for detecting, configuring, and programming SATA/AHCI adapters. AHCI is separate from the SATA standards, but it exposes SATA's more advanced capabilities that are required in the BIOS to fully support an SSD. Partition Alignment is critical but should be correct on a recent system is essential for optimal performance and longevity as SSDs are based on flash memory, and thus differ significantly from hard drives. While reading remains possible in a random access fashion on pages of typically 4KiB, erasure is only possible for blocks which are much larger, typically 512KiB, so it is necessary to align the absolute start of Every partition to a multiples of the erase block size. Use a file system supporting TRIM: in practice this means EXT4 in Linux. Automate TRIM. A SSD system needs some form of automatic TRIM enabled to assist garbage collection otherwise the speed decreases and the number of writes also increases at the expense of SSD life. The default is weekly but this is best changed to daily. Check Queued TRIM is Blacklisted. A number of drives do not correctly support TRIM reliably and, in particular, the queued TRIM command which may need to be inhibited. The latest kernels take care of this but it is a real issue if updating an existing machine or using an LTS (Long Term Support) Distribution with an elderly kernel. Overprovision. This is the reserving of some areas of disk and leaving unformatted. This also desirable for similar reasons to TRIM, namely maintaining speed and decreasing disk writes - a certain amount is already reserved by manufacturers (~7% ) but it is best increased by another 10 to 20%. Control use of Swapping to disk. SSDs have a large but finite number of write cycles and frequent swapping uses that up. The use of swap files is not optimised for desktop machines in Linux for SSDs (or even Hard Drives) and needs to be changed. Inhibit Hibernation. (suspend to disk): This should be inhibited as it causes a large number of write actions, which is very bad for an SSD. If you are dual booting make sure Windows also has hibernation inhibited - in any case it is catastrophic if both hibernate to the same disk. Avoid Defragmentation. It is not required in Linux and is never done automatically. It must be avoided because the many write actions it causes will wear an SSD rapidly - make sure a dual booted system does not kill your SSD by defragmentation and avoid the need by maintaining at least 20% spare capacity on each partition, even in Linux this has benefits. Only four of the above are likely to need addressing in a dedicated Linux system using Ubuntu or Mint with a single SSD and provided by Chillblast - they are in bold. The first two are factors in the initial partitioning of the SSD and the other two are carried out during the setting up procedure. Before going further the best way to reduce wear on the SSD when you also have a hard drive is to keep/put the swap file on the hard drive rather than on the SSD which is where I have it kept it on the Defiant. What follows still improves performance of the hard drive so I have left it in place. It is normally suggested that the swap partition size is the same as the physical memory, it needs to be if you ever intend to Hibernate (Suspend to disk by copying the entire memory to a file before shutting down completely). It is easy to see how much swap space is being used by using the System Monitor program or by using one of the system monitoring applets. With machines with plenty of memory like my Defiant and Helios which both have 8 Gbytes you will rarely see even a few percent of use if the system is set up correctly which brings us to swappiness. There is a parameter called Swappiness which controls the tendency of the kernel to move processes out of physical memory and on a swap disk. See Performance tuning with ''swappiness'' As even SSD disks are much slower than RAM, this can lead to slower response times for system and applications if processes are too aggressively moved out of memory and also causes wear on solid state disks. Ubuntu and Mint both use a default setting of swappiness=60 which is far too high for a modern desktop machine. Reducing the default value of swappiness will improve overall performance for a typical Ubuntu desktop installation. There is a consensus that a value of swappiness=10 is recommended for a desktop and 60 for a server with a hard disk. I have been using a swappiness of 10 on my two MSI U100 Wind computers for many years - they used to have 1 Gbyte of RAM and swap was frequently used. In the case of the Defiant I have 8 Gbytes of memory and Swap is much less likely to be used. The consensus view is that optimum value for swappiness is 1 or even 0 in these circumstances. I have set 1 at present on both the Defiant and the Helios with an SSD to speed them up and minimise disk wear.. I have not implemented it on the Helios as the SSD already gives a huge improvement and extra tuning is unlikely to give any perceivable enhancement. Note this is a single line and is best copied and pasted it into the terminal. One needs to reboot before this is active. After the reboot Hibernation should now no longer be one of the options when you close the computer. Applets which try to hibernate will demand root access. I had again already implemented this before adding the SSD but I left it here for completeness. Earlier version of Ubuntu/Mint used cron to schedule the trims but systemd timers are used in Mint 19. When a service is controlled by a timer there are two linked 'units' which are files with the same name and the service has an extention of .service and the timer an extension of .timer. Only the timer has to be enabled in Systemd for the service to be run as prescribed in the timer. Both are part of the linux system in the case of fstrim and are found in /usr/lib/systemd/system/ and should not be edited directly as systemctl provides built-in mechanisms for editing and modifying unit files if you need to make adjustments. This will be a blank file that can be used to override or add directives to the unit definition. A directory will be created within the /etc/systemd/system directory which contains the name of the unit with .d appended. For instance, for the fstrim.timer, a directory called fstrim.timer.d will be created. Within this directory, a drop-in file will be created called override.conf. When the unit is loaded, systemd will, in memory, merge the override with the full unit file. The override's directives will take precedence over those found in the original unit file. The override.conf file will be opened in the terminal by sudo systemctl edit fstrim.timer in an unfriendly line editor called nano. Fortunately we oly have to paste a few lines into an empty file so the following should be sufficient but if you need ore see https://askubuntu.com/questions/54221/how-to-edit-files-in-a-terminal-with-nano. Paste the new contents with a right click as Ctrl v does not work as a paste. Tip: Timers are cumulative, so in the override one needs to reset the existing timers by an initial OnCalender= otherwise your OnCalendar setting gets added to the existing one. In theory we do not need reload the systemd process if we use edit by a sudo systemctl daemon-reload but I did it anyway and when I repeated the cat I got. Aug 25 03:08:38 defiant systemd: Started Discard unused blocks. I have gone through this at some length as it is a useful technique with wider applicability and I had to spend a lot of time before I understood how systemd timers worked and how to correctly change one. I then partioned the drive using gparted and used a GPT in an very similar way to that the Partitioning on the Helios so I will not repeat it here. The only difference was that the Swap partition deliberately still resides on the Hard Drive to avoid wear on the SSD - it is set up to avoid use with a swapiness of 1 so it rarely gets even 1% use. So the remaining work was just to transfer two system partitions and the home partition to the SSD by 'cloning' the existing partions on the hard drive. I then removed some of the partitions and changed sizes on the hard drive to increase my DATA partition by most of the 250 Gbytes of the SSD. I have tried to adopt the principle of backing up the section I am going to transfer then using the back itself to reinstal in the new location and then clean up after everything has been tested. One is going to back up anyway so why not use it and prove it. This approach gets round a major problem namely exactly copying a folder is not as simple as it seems - you not only need to preserve the contents of the files and folders but also the owner, group, permissions and timestamp. You also need to be able to handle symbolic links and hard links. I have a well proven way of creating and restoring backups of home folders exactly using tar which has advantages as we would create a backup before proceeding in any case! Likewise Mint depends on TimeShift so why not use it to clone the System partitions..
Moving /home - the users home folders. Use the existing backups for the main users but move a very basic user using a different copy method to get a start, change the location of home, then extract the real users and delete the basic user. Modify the backup to get an archive which can be extracted anywhere. Modify the extraction to strip off the extra folder levels. The -a option is an archive copy preserving most attributes and the -r is recursive to copy sub folders and contents. 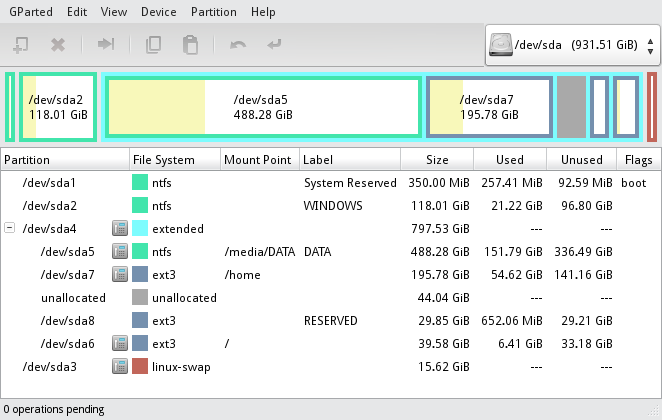 Use gparted to create the new partition and format it but not specify a mount point yet. Depending on which partitions you are shrinking to make space you may have to use a liveUSB with gparted as you obviously can not change a mounted partition. Create an extra and very basic user with admin rights and a password so we can use sudo if you do not already have one. Login to the basic user and make tar backups of every user's home folder you wish to transfer. Mount the new partition (using nemo is fine) and note the mount point which is probably something like /media/randomstring . Check that you are using the new home folder which should at this point just contain the folder for your temporay user. Login and check each user you have restored. I will give an example of the output of blkid and the contents of etc/fstab after moving my home folder to the SSD drive highlighting the changes in red. Note this is under Mint 19 and the invocation for the text editor. /dev/sda1: LABEL="EFIRESERVED" UUID="06E4-9D00" TYPE="vfat" PARTUUID="333c558c-8f5e-4188-86ff-76d6a2097251"
/dev/sda2: LABEL="MINT19" UUID="e07f0d65-8835-44e2-9fe5-6714f386ce8f" TYPE="ext4" PARTUUID="4dfa4f6b-6403-44fe-9d06-7960537e25a7"
/dev/sda3: LABEL="MINT183" UUID="749590d5-d896-46e0-a326-ac4f1cc71403" TYPE="ext4" PARTUUID="5b5913c2-7aeb-460d-89cf-c026db8c73e4"
/dev/sdb1: LABEL="System Reserved" UUID="269CF16E9CF138BF" TYPE="ntfs" PARTUUID="56e70531-01"
/dev/sdb2: LABEL="WINDOWS" UUID="8E9CF8789CF85BE1" TYPE="ntfs" PARTUUID="56e70531-02"
/dev/sdb5: LABEL="DATA" UUID="2FBF44BB538624C0" TYPE="ntfs" PARTUUID="56e70531-05"
/dev/sdb6: UUID="138d610c-1178-43f3-84d8-ce66c5f6e644" SEC_TYPE="ext2" TYPE="ext3" PARTUUID="56e70531-06"
Removing the unused partions and increasing the size of the DATA partition. So now it is time to tidy up the partitioning to make space. This sounds the least risk activity but it is not. Warning about deleting system partitions after cloning. When you come to tidy up your partitions after cloning You Must do a sudo update-grub after any partitio deletions before any reboot. If Grub can not find a partition it expects it hangs and you will not be able to boot your system at all and you will drop into a grub-recovery prompt. It was not a pleasant activity and had far too much trial and error so make sure you do update-grub. There are also some quirks with several SSDs when using Linux, one of which is a show stopper as it is with the Samsung 850 Evo favoured by Chilblast. There is a work-around in later kernels which has been backported to the Kernels which Ubuntu updates to but not the kernel recommended by Mint. See https://bugs.launchpad.net/ubuntu/+source/fstrim/+bug/1449005 and https://bugs.launchpad.net/ubuntu/+source/linux/+bug/1338706. The kernel in use must newer than 3.13.0-57.95, 3.16.0-43.58 or 3.19.0-22.22. Kernels older than 3.12 and latter than 4.0.5 are all fixed. The kernel in Mint 17.3 is likely to be OK so I am not adding fixes yet - web searches will show how to disable TRIM in Ubuntu and in the short term the slow down will be acceptable. The use of swop files is not optimised for desktop machines in Linux. SSDs have a large but finite number of write cycles and frequent swopping uses that up. I was however unaware of many of the other specific requirements of effective use of SSDs which I will start to cover below. A primary way to reduce disk usage is to reduce the use of Swap Space which is the area on a hard disk which is part of the Virtual Memory of your machine, which is then a combination of accessible physical memory (RAM) and the swap space. Swap space temporarily holds memory pages that are inactive. Swap space is used when your system decides that it needs physical memory for active processes and there is insufficient unused physical memory available. If the system happens to need more memory resources or space, inactive pages in physical memory are then moved to the swap space therefore freeing up that physical memory for other uses. The system tries to optimise this by making moves in advance of their becoming essential. Note that the access time for swap is slower therefore do not consider it to be a complete replacement for the physical memory. Swap space can be a dedicated swap partition (normally recommended), a swap file, or a combination of swap partitions and swap files. The hard drive swap space is aslo used for Hybernating the machine. Reducing the default value of swappiness will actually improve overall performance for a typical Ubuntu desktop installation. There is a consensus that a value of swappiness=10 is recommended for a desktop and 60 for a server with a hard disk. I have been using a swappiness of 10 on my two MSI U100 Wind computers for many years - they used to have 1 Gbyte of RAM and swap was frequently used. In the case of the Defiant I have 8 Gbytes of memory and Swap (aka Block Cache) is much less likely to be used and the consensus view is that optimum value for swappiness is 1 or even 0 I have set 1 at present. Since setting up my machine I have found out a lot more about use of SSD disk drives. Mine has a hybrid drive which, I hope, has some internal optimisation and does not require the following. However if you have a pure SSD then one needs to reduce the writes to the drive (partially covered above), align partition boundaries (gparted normally does that to 1 MiB boundaries by default) and use a file system which allows Trimming of the drive (ext4 rather than ext3 or ntfs) along with efficient journalling. Also one should not defragment a pure SSD as it causes excessive writes and is not required. Airplane (or Aeroplane) Mode: Better handling of Airplane Mode (Fn F11) where all transmitters are disabled to allow use on Aircraft - now handled by keyboard shortcut Super + F11 as Fn key used does not act as a 'modifier' in Mint. It opens the Network Settings screen which has the Airplane Mode switch. Issue is that this does not activate the light and does not switch off the Hardware hence there are no power saving advantages. Again it is best to reinstall the operating system when updating to Mint 18 although if you do it carefully and have a separate partion for /home you should be able to maintain all your configuation. Changes between Ubuntu 14.04 Trusty and 16.04 Xenial LTS versions on which Mint 17 and 18 are built. These are LTS versions spaced by two years and the diffferences are considerable, in particular the initiation and control of Daemons and Services use SystemD instead of Upstart. One results is major differences in 'power' handling between Trusty, which Cinnamon was designed to use, and Wily. The result is that anumber of Applets and Keyboard shortcuts involving shutdown, hibernate, suspend and restart will need to be modified. I had, for example, defined a shortcut keyboard bindings to Ctrl+Alt+s and Ctrl+Shift+S to provide an easy suspend. The access to Shortcuts is via System Settings -> Keyboard -> Shortcut tab -> Custom Shortcuts -> Add Custom Shortcut - call it Suspend and put systemctl suspend as the Command then click on unassigned and press the key combination you want. You can add up to three alternatives. If you want to add this under Mint use the alternative from above dbus-send --system --print-reply --dest="org.freedesktop.UPower" /org/freedesktop/UPower org.freedesktop.UPower.Suspend. I know I will have to make changes in NUMA if I want to continue to use an automatic suspend or other action if data limits are exceeded. All very quick and only issue was that I had to replace the Window List with App Grouping applet with Icing Task Manager as Window List with App Grouping applet has not been supported for many years although it is one of the most popular and to me essential applets. Icing Task Manager is a fork which has been updated and enhanced and is now much better. Mint 18.3 is the first version to include TimeShift. The major new consideration in a fresh install of Mint 19 whilst retaining the /home partition is TimeShift which is now fundamental to the update manager philosophy. To Quote "The star of the shown Linux Mint 19, t is Timeshift. Thanks to Timeshift you can go back in time and restore your computer to the last functional system snapshot. If anything breaks, you can go back to the previous snapshot and it's as if the problem never happened. This greatly simplifies the maintenance of your computer, since you no longer need to worry about potential regressions. In the eventuality of a critical regression, you can restore a snapshot (thus canceling the effects of the regression) and you still have the ability to apply updates selectively (as you did in previous releases)." The best information I have found about TimeShift and how to use it is by the author. TimeShift is similar to applications like rsnapshot, BackInTime and TimeVault but with different goals. It is designed to protect only system files and settings. User files such as documents, pictures and music are excluded. This ensures that your files remains unchanged when you restore your system to an earlier date. Snapshots are taken using rsync and hard-links. Common files are shared between snapshots which saves disk space. Each snapshot is a full system backup that can be browsed with a file manager. TimeShift is efficient in use of storage but it still has to store the original and all the additions/updates over time. The first snapshot seems to occupy slightly more disk space than the root filesystem and six months of additions added another approximately 35% in my case. I run with a root partition / and separate partitions for /home and DATA. Using Timeshift means that one needs to allocate an extra 2 fold storage over what one expects the root file sytem to grow to. In the case of the Defiant the root partition has grown to about 11 Gbytes and 5 months of Timeshift added another 4 Gbyes so the partition with the /timeshift folder neeeds to have at least 22 Gbytes spare if one intends to keep a reasonable span of sheduled snapshots over a long time period. After three weeks of testing Mint 19 my TimeShift folder has reached 21 Gbytes for a 8.9 Gbyte system! This space requirements for TimeShift obviously have a big impact on the partition sizes when one sets up a system. My Defiant was set up to allow several systems to be emplyed with multiple booting. I initially had the timeshift folder on the /home partition which had plenty of space but that does not work with a multiboot system sharing the /home folder. Fortunately two of my partitions for Linux systems plenty big enough for use of TimeShift and the third which is 30 Gbytes is accceptable if one is prepared to prune the snapshotss occassionally. The order is imrtant and must match the original order. This is because new users are added with successive user numbers starting at 1000 and the user names one sees are only aliases for this number. If users are added in a different order they get all mixed up! Groups are also numeric but do not seem to have the same problems. If you want to know the order then use id which will give an output like the following. It is important to make Bumblebee work if you have an NVidia Optimus based dual processor machine as nvidia prime is very slow and also needs a full reboot every time you change graphics processor unlike previous versions. It took me several days to get Bumblebee working but it was worth it for the 7 - 8 watt power saving. This guide is loosely based on the Launchpad Bug Report 1758243 for the Bumblebee Package with input from Bumblebee Issue 951 as well as my own experiments. In sumary; bumblebee fails to work in Ubuntu 18.04, or Mint 19 which uses the same package base, with nvidia-driver-390 unless a number of configuration changes and other fixes are made. This is a dificult proceedure and there is no easy way to undo some of the changes so use first make a copy using TimeShift. I used it and made half a dozen snapshots and had to to do many restores before I got this proceedure working. It seems excellent - almost as useful as branching in Git! 0. Firstly one needs a completely fresh start with nothing to do with nvidia or bumblebee installed. One should cary out the three initial configuration changes before rebooting. That should bring in all the packages which are reqired. 2. For power management to work (ie turning the nvidia card off whilst not in use), the nouveau and nvidia modules need blacklisting so they don't load on boot, and nvidia_drm and nvidia_modeset need aliasing to off so they never load. Otherwise, nvidia_drm attaches to drm_kms_helper and then bumblebee can't unload the nvidia module and turn off the card. nouveau also needs to be aliased to off as other programs try to load it. Now reboot because nouveau is already loaded, but the change should be permanent unless something else re-enables the nvidia-fallback service. I am not sure if this will need to be repeated and how often. After this optirun worked as expected. NOTE. You will need to (re)install nvidia-settings if you want to use the bumblebee applet as it is used to obtain the nvidia processor temperature. For some reason it did not install using the GDebi Package Installer. Primusrun did not work for me as it looks for an non existent path to: /usr/lib/x86_64-linux-gnu/mesa/libGL.so.1 . which works for me or by editing /usr/bin/primusrun directly, and putting PRIMUS_libGL=/usr/lib/x86_64-linux-gnu/libGL.so.1 inside that file. in the grub configeration - see above. I found this suggested in several threads found during internet searches which indicated this gets round a problem with NVidia not playing well with kernels after 4.8 prior to which that was the default - for example https://devtalk.nvidia.com/default/topic/971733/linux/-370-28-with-kernel-4-8-on-gt-2015-machines-driver-claims-card-not-supported-if-nvidia-is-not-primary-card/post/4999717/#4999717 . These have not stoppped every error message in dmesg and the log files but have meant the machine has been up for 5 days continuously during which it only returned in a virtual terminal (tty1) once and even then could be returned to the GUI instantly by Ctrl Alt F7. Before this problem I was only dimly aware of the virtual terminals and switching between them and the GUI and use of Ctrl Alt F7 has changed my Suspend/Resume errors from being a show-stopper to an inconvenience. I have had sufficient problems that I decided it was time to remind myself of ways to escape from various lockups in a tidy manner. This article is a good start on The Magic SysRq Key on Linux to Fix Frozen X Servers, Cleanly Reboot, and Run Other Low-Level Commands . Wine seems to sometimes hang for up to a minute when running Dreamweaver 2004 MX as well as a number of other odd issues using the Wine version in the Mint Repositories in combination with the existing wine installation in the .wine folder with the version of wine in the repositories and my old wine system in .wine. I found no way of fixing the problems without starting afresh by removing all traces of the old version of wine, reinstalling wine from the WineHQ development branch and reloading all the programs I use in wine. I first tried this in a cloned system. Rename your .wine folder to wine-bak You will need to do this for every user as every user has a complete independent wine system. In the unlikely event that apt-get complains about missing dependencies, install them, then repeat the last two steps (update and install). Note: The WineHQ proceedure does not at present install the packages for wine-gecko or wine-mono but the first time you install a program in wine you will be asked if you want to download them. You must click Yes to both. You will need to do this for every user as every user has a complete independent wine system which needs these installed.. I found the programs appear in the Cinnamon Menu and often the install programs also offer the option of adding to the desktop which also seems to work. When running, the wine programs may show up correctly in the panel or need some work as Wine seems to use a greater depth of menu folders than the Menu accepts and some of the .desktop files may need to be moved in ~/.local/shared/applications up a level after which the built in menu editor can be used. Wine programs may show up under 'other' but can be moved using the menu editor available with a right click on the 'standard' Menu. Once they are in the menu they show correctly in Icing Task manager Applet and can be pinned and started there. Remember: The removal of .wine and reinstalls and re-configurations will now have to be repeated for all the real users. I discovered that fonts were rendering very badly in the version of wine and under Mint 19 - it looked as if there was no font smoothing and it was almost impossible to use my old copy of Dreamweaver MX for HTML editing. I checked that msscorefonts was installed and in the end did a web search and found https://askubuntu.com/questions/219791/improve-gui-appearance-of-wine-applications where there is a script which allows you to select the font smoothing used in wine and choosing Subpixel Smoothing (Cleartype) RGB made a huge improvement. This moves the settings file that enables hibernation, to the main directory / (root) thus rendering it ineffective. Debian bug #844453 - apt-daily.service shouldn't be run during boot, but only some time afterward. Often you will find that the apt-daily.service is very long especially on a hard drive. This changes the "timer" that triggers apt-daily.service to run at a random time between 15 min and 45 min after boot, and once a day thereafter. See the systemd.timer manpage for additional (not very well written, alas) explanation of what this means. Although I have implemented this I suspect it is a red herring as it is not in any critical path so does not slow the boot other than by using resources . Debian and Ubuntu 18.04 and hence Mint 19 have removed gksu and libgksu. Using a plain sudo to run graphical programs has dangers as configuration changes can end up with configuration files owned by root in your home folder. to reach or open the grub file. You will be asked for your admin password. I am sure I will get used to that as an alternative. Tip: There is a right click item in nemo to open a folder as root which I use a lot to reach and then open files as root - this avoids the use of the terminal. Developers can also use PolicyKit (pkexec) to use elevated privileges for the specific actions where it is needed but that involves creating policies for every program. Fix for Epson SX510w Gutenprint version 5.2.13 driver printing far too dark. This was a major issue as printed images were completely unacceptable and could not be adjusted in printer settings. I tried adjusting in various programs such as LibraOffice and the image viwer as well as in Printers itself with little effect. Comparison with a different machine showed that a different version of gutenprint print driver was in use in Mint 18.3 where the results were perfectly acceptable without any adjustment. I found that going back to the version 5.2.11 used in Mint 18.3 gave me a perfect working printer as in Mint 18.3. Use the Synaptic package manager and search for gutenprint which should show there are two packages installed. and download them both from an appropriate local link on the pages. This currently offers the earlier version of Firefox (52) but with full security updates. Firefox Quantum is a disaster to those who use add-ons as as few still work and the authors are not intending to continue. Firefox ESR currently supports all my favourite add-ons but only till September.